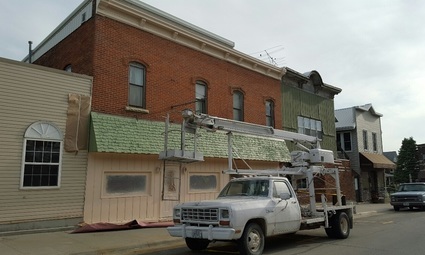 Brenen's Interior & Exterior Painting - Monona Chamber & Economic Development, Inc.
historic downtown Monona, IA where I painted adjoining Italianate commercial buildings. With over ten years of on-the-job experience in the interior and exterior painting business, I have helped hundreds of commercial, residential, and municipal customers with their painting needs. Using only quality paints and supplies, I also have all of the right equipment at my disposal to produce top-notch results and give your project the attention you deserve. I love what I do and it shows in my work from a job's start to finish. Safety is No. 1 and I routinely practice safe work habits. Using extreme caution at job sites, I take the best care of my customers' personal property as if it was my own property. Deadlines are very important to me and, weather permitting, I will finish your job as promised or will promptly communicate any changes upfront with you.. Please give me a call today to provide your FREE time and cost estimate. I look forward to helping you with all of your interior and exterior painting needs. These before & after photos show my work and expertise from start to finish. My customers expressed to me their complete satisfaction with the quality of my work on their historic building improvements. References available.